Some are hot, and some are not. Some are hot and some are not. Ahem. We’re talking peppers here. Padrón peppers to be specific. As the Galician saying goes: pimentos de Padrón, unos pican e outros non. 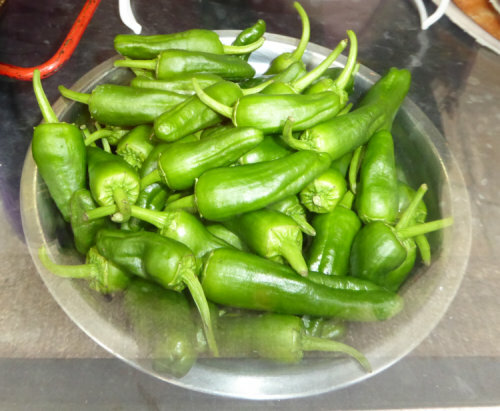 (Padrón peppers, some are hot and some are not). So what are Padrón peppers? They’re a smallish green pepper from Spain’s Galicia region, and yes, some are hot and some are not. Usually not kill-taste-buds hot. But sometimes eye-watering hot. First of all, Padrón is a bit of a misnomer. Technically speaking, these peppers are from the Herbón area south of Santiago de Compostela (Galicia region, northwest Spain). Padrón is a town in the area, but important for the peppers: San Antonio Franciscan convent (14th c) is in the Padrón parish, and it was the Franciscan monks who brought these peppers from the Americas, probably in the 16th century. The peppers are so unique in Spain that they have their own Certified Origin, registered as Pimientos de Herbón, not Padrón, an important technicality if you’re at the market and want to be sure you get the right thing. But in a bar or if talking with friends, for now they’re Padrón peppers, just like they’ve always been – perhaps the alliteration makes the name sound better. And scientifically, they’re Capsicum annuum. Padrón peppers are best shared with a group of friends. Hot from the frying pan, liberally sprinkled with coarse salt and heaped on a plate, they’re an inviting sight. But beware: some are hot, and some are not. Sort of culinary Russian Roulette. The traditional way to eat these peppers: pick up by the stem and pop the whole thing in your mouth (more cautious people will nibble the end first). Your friends are watching, either openly or out of the corner of their eye, evaluating the temperature of your pepper by the expression on your face. The theory is that odds change as more or fewer hot peppers show up on the plate – and while technically about 10% of Padrón peppers are hot, that doesn’t necessarily mean 10% on your shared plate. They could all be mild, or half hot: the 10% rule is over the entire production of peppers. What makes the peppers hot is capsaicin, just like Padrón pepper “cousins” serrano or jalapeño peppers. But in Padrón peppers, the amount of capsaicin varies a lot depending on how much sun and water the plant got when growing. Traditionally Padrón pepper pickers have been women, and they mix the peppers they think will be hot with ones that will be milder. Thus the variation in pepper temperature when they reach your shared plate. There is lots of lore about identifying which Padrón peppers are hot. Pepper experts say that the hottest peppers are longer in shape, or have longer stems, or are bigger and a bit reddish, or even that the coarse salt sticks less to hot peppers than to mild peppers. And a restaurant owner (as much of an expert as anyone on this topic) says that late in the season in a dry year, there tend to be more hot peppers, and hotter hot peppers. Got a hot one? Don’t panic – and don’t try to cool down with water, beer or the local Ribiero wine (a great companion to any Galician tapa experience). The best solution is to eat bread. If at all possible, the hearty, coarse-grain Galician bread. Still not ready to do it? Alas, the Padrón Pepper app promising to take the guesswork out of pepper tasting has disappeared from Google Play store. It had a hundred-percent accuracy guarantee: scanning the pepper with the phone’s camera it could evaluate pepper temperature. And if the pepper-eater disagreed with the analysis, the problem was with that person’s palate, not with the app. So until the app or something similar appears, you’ll just have to take your chances with Padrón peppers: some are hot, and some are not. Padrón or Herbón? The Certified Origin regulation council is trying to change the name officially to Herbón peppers, to differentiate their peppers from similar peppers grown elsewhere. Pepper season: the true Padrón pepper season is May to late October, though now peppers are grown in hothouses in other parts of Spain and Morocco and available most of the year. Hothouse peppers might have a slightly different taste and different proportion of hot and not. Padrón Pepper festival: usually the first Saturday in August in Padrón town.